Asian ladies chants as they push carts full of steamy Dim Sum across the aisles of a crowded Cantonese Dim Sum Restaurant. 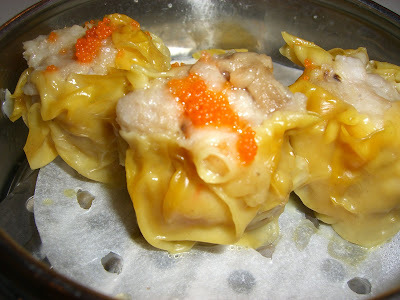 Siu Mai is in Cantonese dialect. In the Mandarin dialect, it is called Shao Mai. Currently, there are two versions of Shao Mai in Wikipedia, the Cantonese version which has the ground pork, shrimp(optional), chinese black mushroom and the Jiangnan version which has an additional ingredient, the sweet glutinous rice. In this article, I will be sharing the traditional Pork Shao Mai and my favorite, the Quail Egg Shao Mai recipes. Tip 1: Although it is more convenient to buy peeled shrimp, I always buy shell-on and head-on shrimps, and peel the head and skin off myself, because the all the shrimp flavor are still in tact. Tip 2: Use a little more water to mix with the ground pork if leaner ground pork is used. Tip 3: With your hands, gather the mixture into a ball and throw it against the inside of the bowl for 3 to 4 minutes. I saw my MIL doing this and I find that her meat balls are ever so tender. Caution: Quail eggs (thanks Julie Yee for this note) and shrimps have high cholesterol. So, eat in moderation. For the filling: Dice Chop the pork loin, shrimp, pork fat and bamboo shoot. Place in a mixing bowl and add seasonings. Mix well. To wrap the Quail Egg Shao Mai: Place a quail egg in the center of the wonton skin. Put 1 portion of the filling on top of the egg. Push the filling down gently with a wet spoon. Place the Shao Mai, open side down, in a steamer about 1/2 inch apart. Steam for 6 minutes over high heat. Remove and serve. For the filling: Dice Chop the pork loin, pork fat, mushroom and bamboo shoot. Place in a mixing bowl and add seasonings. Mix well. To wrap the Pork Shao Mai: Place 1 portion of the filling in the center of the wonton skin. Push the filling down gently with a wet spoon. Place the Shao Mai, open side up, in a steamer about 1/2 inch apart. Steam for 6 minutes over high heat. Remove, garnish with masago eggs and serve. And now for some fun. I have been tagged by Suganya. I will use the similar format as her. 2) Took piano lessons but not musically inclined. My daughter, on the other hand, is musically gifted. She has won piano competitions one after the other. Her fingers glide through the black and white keys effortlessly. 3) Not too crazy about cartoons but my hubby and 2 older children are fans of Scooby Dooby Doo. 4) After 16 years, I am thankful to God that I can maintain a great friendship with my classmate from college. Currently, we email each other, at least once a week, and sometimes once or twice a day. She is my Angel who advices and comforts me. Although she never leaves a comment on my blog, she leaves nice encouraging comments via emails to me. 5) Like Suganya, I can also easily start a conversation even with a stranger and can make friends within minutes. 6) The details on how I started blogging is in my “About Me” page but in short, I was inspired by another Mom who blogs about food. 7) I have never baked a pumpkin pie but if Suganya can’t do it well, I probably can’t as well. And, C’mon, you can make a better pie than me. You can even find me a fool-proof recipe..
You think I can make a better pie than you? I am not sure about the Pumpkin Pie that you mentioned in your article but I make a pretty good Siew Pao that uses the same crust as the Pie. Thanks for inviting me to play the “7 random facts about me” game. And now, we know a little bit more about each other. My mom mentioned that you can marinade the prawns (with the shell intact) with a little sugar and keep it over night in the fridge. This will give the prawns a more “crunchy” texture to it when cooked. Waaa… Mrs HBT, now you’ve made me crave for Siu Mai even though I’m not usually a big fan. Nevermind, I’m going to Malaysia next month – can have my fill of it and Siu Loong Pau at Dragon-I in 1-Utama (new wing), PJ. Thanks for your prayers. I am better now. A little “Moong Char Char” (Scatterbrained) at times but I can say I am slowly regaining my energy and I can do more and more activities in a day. Chicken egg has the least cholesterol. Although my husband is on cholesterol medication, he avoids food that has high cholesterol. He really did not know about quail eggs before. You mentioned that you use onion for your Siu Mai. I think that will tastes very good as well. In fact, my MIL makes her famous Lion’s Head Pork Balls using ground pork and chopped onion. You are going to Malaysia? That is sooooooo exciting! I love Siu Loong Pau as well. Actually, I don’t think there’s any food that I don’t like, if it is made in Malaysia. Like yourself, I was not a big fan either. However, recently, we were at a small family owned chinese restaurant and they served us one of the best Siu Mai. When the Siu Mai first came out of the Bamboo Steamer, the aroma from the mushroom, immediately induce my appetite and after one bite, I was hooked. p/s Have you seen Jaden’s homemade Siu Loong Pau? Oh they must be gorgeous, they are my favourite dim sum. I love anything in Dim Sum shich has shrimp in it. Ah, so you used them for Quail Egg Shao Mai, nice! I saw it served in the dim sum restaurant too. I also like the quail eggs in steamboat, so cute and so easy to just pop it into the mouth. Now looking at the cholesterol fact, scary man! Luckily I don’t buy it because hubby prefered me not to eat quail and quail eggs, he got the heart for this little bird. LOL! your shao mai look so yummy! did you chop the pork yourself?? I like pork shao mai, and yours look very yummy! You love anything in Dim Sum which has shrimp in it? How about making a cheesecake with shrimp? Your latest cheesecake and laksa articles are mouthwatering. We also eat Quail Eggs in steamboat. Since you are so young, if you eat the eggs in moderation, you will be ok. Your husband has heart for birds? He must be a passionate person. You are very blessed. Thanks. Not only was it yummy, it was healthier as well because I used extra lean pork. 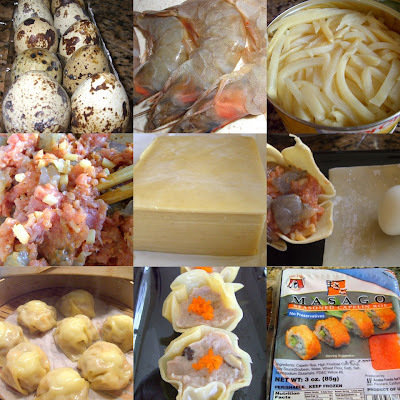 shell-on and head-on shrimps – i saw my friend “digging” the roe from the head and addin’ them into shrimp and or pork filling whenever making wonton, shao mai etc., do you think will add flavor? That was tip number 4! The “roe” from the shrimp’s head is the gem. It is full of flavor but unfortunately, I was told that it also has the highest amount of cholesterol, which was why I omitted tip number 4 from my article. wow this is so special with quail eggs. must try one day. Anyway, I’ve come out with this year’s Merdeka Open House topic, pls check Merdeka Open House 2007. Hope you can join the fun. I never knew that Shao Mai had to be steamed upside down! Thx for sharing your secrets too! I’m a bit like you – I took piano lessons for years but am not gifted musically. it used to be such an effort for me ! Today I made pickled lime and pickled lemon roughly based on Manisha and Cynthia’s recipes — the jars have to stand in the sun every day for 4 to 8 weeks. That is testing my patience already. Yes, I’m looking forward to my trip to M’sia. Will make a shopping list of ingredients. Any suggestions? wow! what’s better then homemade Siew Mai. You are such a talented cook! Wah, they look very good. I’m almost tempted to try making it, ROFL! siu mai! best with pork..cant seem to fall in love with the porkless siu mai hehe..
You are a woman with many talents, in particular, cooking and writing. I am studying your Pulka and Chicken Briyani recipes currently. I hope to make it for my parents when they are visiting. Let me know how it works out for you…. I made Siu Loong Pau before I started blogging. It is an involved process. I used high stock when I make Siu Loong Pau. High stock is a little gelatinous when the temperature is low. However, when the temperature increases, it melts. I am a “snail” in the kitchen, I thought using jelly was brilliant because it will not melt. Pickled lemon lime and lemon project sounds fun. I saw Tyler Florence (food network star) did that once. 4 – 8 weeks does sound a little long, but you are going to enjoy the end result. Shopping list of ingredients from Malaysia? I have to think about this one. Not related to food, my Mom brought me a pack of natural hair coloring from Malaysia last year and I liked it. Thanks for your compliments. It is nice of you to stop by and leaving me such nice comment. Thanks for your comment. I used ground pork (minced pork) as well. Using pre-minced ground pork saves me time from chopping and chopping. Repetitive motion is bad for my shoulder tendonitis as well…. If you can make pizza, you can make this. The good thing about making your own is you can reduce the fat content. And if it doesn’t taste good, you can eat less and thus automatic weight reduction… Not that you need to lose any weight but I thought I mention that since you talked about going on diet before, on your blog. Well, I got tons of pork in my Siu Mai for sure. Natural hair colour from M’sia? Is it that reddish-brown henna or darker brown, more like our natural hair colour? If it’s dark brown or black/brown, may I ask where your mum bought it? Coz every month I use synthetic hair colour (I’ve a lot of grey) but I don’t think it’s good for our health as it sits on our scalp for 25 minutes. Methinks my shopping list should include star anise, fenugreek & methi seeds, chilli & curry powders, clove, pandan leaves, and contact lens solution/cleanser (they’re 3 times dearer here!). Additional suggestions are welcome. If you can make Roti Canai, I am sure you can make Siu Loong Pau, jelly and all. I just wrote an email to Dad to find out where in Malaysia Mom got her Henna. It is most probably from Klang (30 minutes from KL), at Indian groceries. Dad is very good about returning my emails (or anyone else’s) so, when he replies, I will let you know. You mentioned Pandan Leaves. Are you planning to bring dried Pandan Leaves or live Pandan plant back to Switzerland? I just remembered Little Corner of Mine made Green Tea Pound Cake from the Green Tea powder that she brought back from Malaysia. So, if you are a Green Tea fan, you may consider that. Both Henna and Green Tea powder should be OK at the airport when you are going through Swiss’ Customs. I’m planning to bring back pandan leaves, not the plant ‘coz I heard it won’t live long in a temperate country. Green tea powder sounds like a good buy, thanks. I took a photo of the Hair coloring package that my Mom gave me. Here’s the photo of it. The packet says “Brown Henna”. Mom says it is very cheap. You could buy a packet and test it out on a small area first. I am not sure if it has an orange tint or not. Mom uses it and I don’t remember her hair looking orange. I have a few strands of hair in the front that has turned grey. I have been using tweezers to remove these grey hairs. I am going to miss reading your comments when you are on your vacation in Malaysia. Minced Pork, chopped Cabbage and Water Chestnuts is a very good combination for another variation of Siu Mai. The Siu Mai’s skin is made out of the wonton skin. And I love deep fried wonton skin. So, I think deep frying the Siu Mai will make it a great finger food for the young and old. I think I’ll try this shiu mai. I always garnish the top with chopped carrots instead of crab roe or fish roe. Mrs HBT, if we manage somehow to split the hair follicle into two, the one plucked grey hair could turn into two. Ouch! I laughed when I read your comment. I hope I don’t wake up Little Chicken who is sleeping next to me now. Sometimes, when I accidentally plucked a black hair, I will console myself with that same theory; maybe it will grow 5 new shiny black hairs. I’ll soon post a link to you.. and check your blog more often!!! Thanks for coming by. Enjoy your trip to Beijing this summer. Hi, I stumbled on your blog and I wished I found it earlier. I just made Siew Mai and I would have used the tip you shared – throwing the meat mixture against the side of the bowl. Thank you for sharing! You have a wonderful blog.